Sooner or later it happens to everyone. Whether it’s from a hail storm or a flying rock on the highway, somehow a crack ended up in your windshield. Maybe it’s just a tiny crack or maybe it stems all the way across your window, either way, you really shouldn’t continue driving until you can get your windshield fixed. Read on to find out why. Any sized crack causes the structural integrity of your window to be compromised. Compromised glass has a higher chance of becoming more cracked when facing the elements – expanding and contracting due to fluctuating temperatures, Applied pressure as you drive over bumps and dips in the road, other cars spinning up rocks and other hard debris, and dirt finding its way into the crack. All of these scenarios have the potential for your glass to “shatter” or create a spider web across your windshield. Due to a windshield’s structure, the glass is unlikely to actually collapse into your car or out onto your hood. A windshield is made up of three layers – two pieces of laminated glass with a layer of plastic sandwiched between them. The laminated glass not only holds the windshield together but also holds it to the frame of the car. But just because the glass is unlikely to collapse on you does not mean that it is safe to drive with. It might seem that a tiny crack is not much to worry about, but cracks grow. Sometimes they grow so slowly you hardly notice, and other times they spread across your whole windshield in a matter of hours. As mentioned before, this all depends on the elements that your car is exposed to, but another particular element worth mentioning is water. Due to the three-layered structure of a windshield, moisture can easily become trapped in-between the layers when a crack is present. When exposed to extreme cold, the water will then freeze causing your crack to become rapidly more widespread. 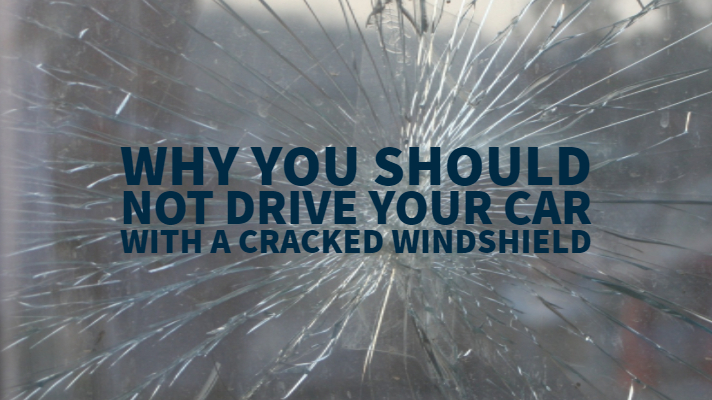 Oftentimes, chips and small cracks can be repaired without having to replace the windshield. Once a crack becomes too large the whole window must be replaced which is more time consuming and costly. Not to mention that as the crack grows bigger your line of sight becomes more compromised as you drive, posing a safety hazard to you, your passengers, and other drivers on the road. While there are no specific laws in Alabama about driving with a cracked windshield, the law does state that the windshield cannot be obstructed in a way that hinders the driver’s vision. The glass must be free from damage in the area starting at the top of the steering wheel up to within two inches of the top of the windshield. You are allowed under Alabama law to have transparent material (think clear packing tape) covering the cracks, however, this is just a temporary fix against dirt and moisture. Call Chamber’s Auto Glass to get your windshield taken care of properly.